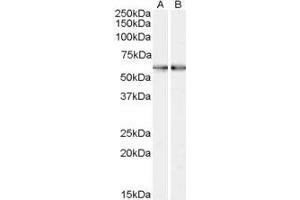 A) ABIN2560026 and B) ABIN2560026 (0.3µg/ml) staining of Human Bone Marrow lysate (35µg protein in RIPA buffer). Primary incubation was 1 hour. Detected by chemiluminescence.